Gallia Academy junior Peri Martin (7) sets the ball, during the third game of the Blue Angels’ straight games victory on Tuesday in Centenary, Ohio. Meigs senior Madison Fields passes the ball, during the Lady Marauders setback on Tuesday in Centenary, Ohio. CENTENARY, Ohio — A perfect 10th. 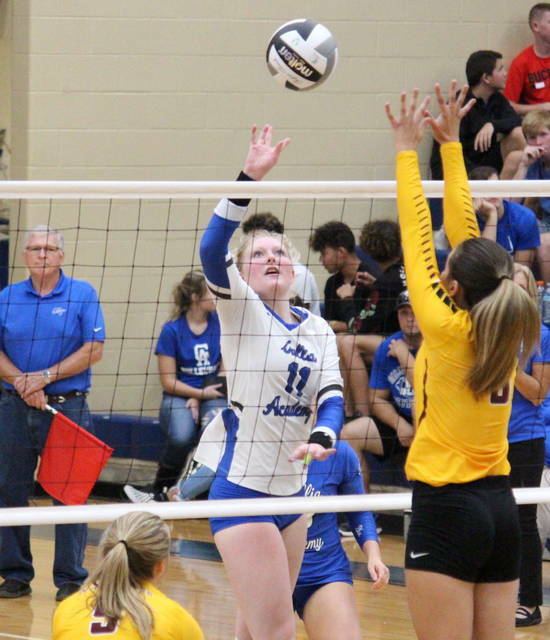 The Gallia Academy volleyball team improved to 10-0 on the season with a straight games victory over Meigs, in a non-conference match on Tuesday in Gallia County. 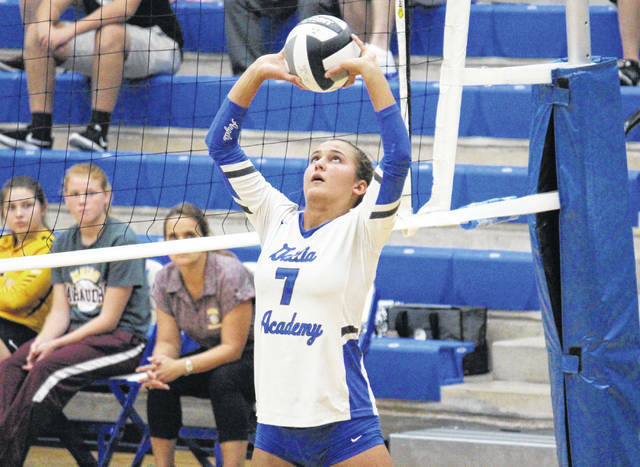 Gallia Academy — the 13th ranked team in the latest OHSVCA Division II coaches’ poll — has now won 16 consecutive regular season matches, and 46 consecutive single games in the regular season. 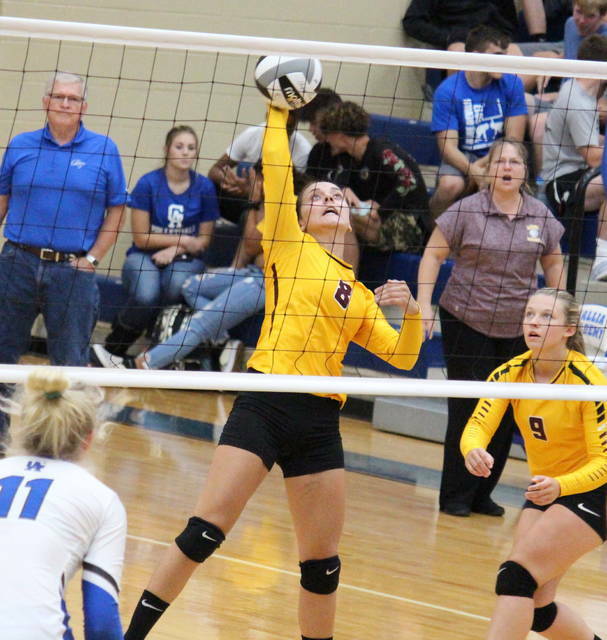 Meigs (3-10) — which has now dropped four straight matches — led 1-0 in the opening game, but surrendered the next three points and never regained the advantage. The Blue Angels had a trio of 5-0 spurts in the first game and ultimately won by a 25-6 final. Gallia Academy scored the first three points, and led wire-to-wire in the second game. GAHS stretched its advantage to as many as 13 points in the second and settled for the 25-13 victory. The Lady Marauders scored the first point of the third game, but Gallia Academy claimed the next five and never trailed again. Meigs cut its deficit to 5-4, but the Blue Angels scored eight of the next nine points to gain some breathing room. GAHS led by as much as a dozen in the finale, and sealed the match with a 25-14 victory. Following the win, fifth-year GAHS head coach Janice Rosier noted the momentum the Blue Angels were carrying from their sweep of Jackson the previous night. “Anytime you play more local teams, I think it brings out the best in you,” Rosier said. “We always get excited for Jackson, and with that being last night, it just fed over. In the match, Gallia Academy had a side-out percentage of 68.6, while the Lady Marauders earned a side-out percentage of 30.1. The Blue Angels finished with 41 kills and a hitting percentage of 36.o, to go with 15 aces and a serve percentage of 93.2. Meanwhile, Meigs had eight kills with a sub-zero hitting percentage, along with two aces and a 94.3 serve percentage. GAHS also held a 37-to-32 advantage in digs and was responsible for all of the game’s blocks. Another key for the Blue and White was getting a strong attack out of difficult situations. Gallia Academy’s service was led by Alex Barnes with 14 points, half of which came by way of aces. Taylor Burnette was next with 10 points and one ace, followed by Maddie Wright with nine points and two aces, and Bailey Barnette with seven points and two aces. Hunter Copley had five points and one ace in the win, Ashton Webb added three points and an ace, while Peri Martin marked two points and one ace. Meigs’ service was led by Maci Hood with six points, including one ace. Madison Fields had three points and an ace for the guests, while Baylee Tracy added two points. At the net, GAHS was led by Webb with 23 kills. Alex Barnes had seven kills and a block for the victors, while Wright and Maddy Petro had five kills apiece, with a trio of blocks by Petro. GAHS senior Aubrey Unroe finished with one kill and one block, Copley added a block, while Martin earned a match-best 33 assists. 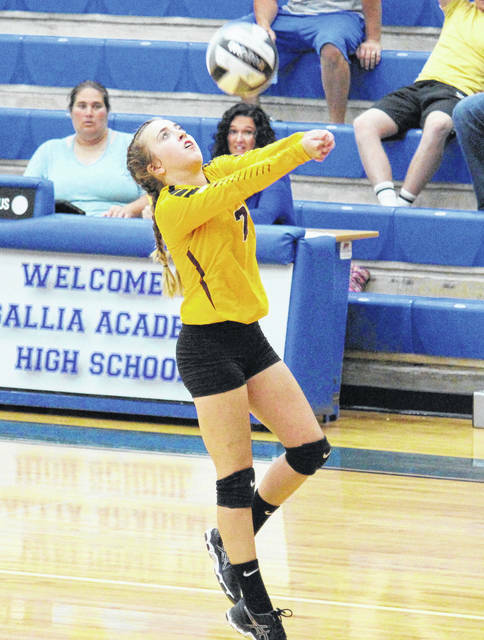 Burnette led Gallia Academy’s defense with 11 digs. Hannah Durst and Marissa Noble led the Lady Marauders with three kills apiece. Hood earned a pair of kills, with Fields dishing out a team-best six assists. Noble also led the MHS defense with seven digs. GAHS resumes Ohio Valley Conference play on Thursday when it hosts Rock Hill. The Lady Marauders will be back in Gallia County for a Tri-Valley Conference match at River Valley on Thursday.